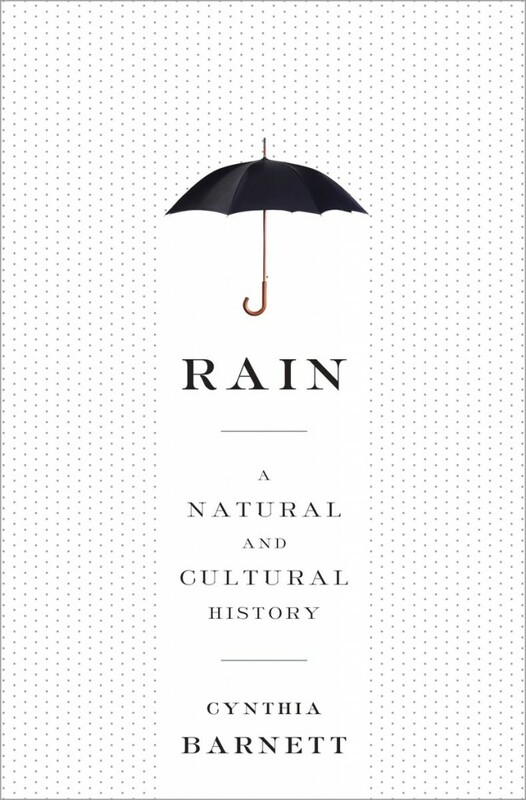 Cynthia Barnett’s Rain: A Natural and Cultural History, is exactly the kind of natural history book I love. It’s lyrical (as you’d expect, since rain figures in many poems and songs) and informative and just plain fun to read. It’s also a good reminder that no matter how plastic and artificial our lives sometimes feel, rain is wild, unpredictable and precious. For those of us who live in urban areas, it’s easy to forget how vital and extraordinary rainfall is, until there’s not enough of it, and farms blow away as dust, and the price of bread soars. At other times, we notice only when there’s too much rain and our basements flood, or worse, entire buildings are swept away in raging currents. Throughout history, rain has influenced the migration of animals and the movement of human populations. The lack of rain emptied our wallets when we looked to “rainmakers,” charlatans who claimed the ability to conjure rain from clear skies (did you know the U.S. Congress bankrolled a bunch of rainmakers in the 1890s? Yet another example of taxpayer dollars literally going down the drain). On the flip side, the abundance of rain has led us to re-sculpt the earth with dams and dikes and levees and canals. Rain has inspired writers; think Ray Bradbury, who imagined a rainy red planet in The Martian Chronicles, or Timothy Egan’s The Worst Hard Time, a recounting of the Dust Bowl years. With the success of The Weather Channel and its slicker-clad meteorologists reporting from the field, rain has even become must-see TV. Barnett’s book is fascinating, written in an accessible, interesting style. Although my copy was provided free through LibraryThing.com, my opinions are my own and I recommend this book.